Bike EXIF is the global showcase for custom motorcycles. Founded in 2008 by publisher Chris Hunter, it’s the go-to source for profiles of the latest café racers, bobbers and scramblers, with an upmarket and engaged audience around the world. The site now attracts over a million page views every month, and generates around three million monthly impressions on social media. It is often chosen by manufacturers such as BMW, Harley-Davidson and Yamaha to reveal their ‘factory’ custom builds. You can also get Bike EXIF articles via email. And then join the conversation on Instagram and Pinterest, or Facebook. We get lots of questions about this site. Here’s an interview with founder Chris Hunter in New Zealand’s largest newspaper. Who writes for Bike EXIF and where are you based? 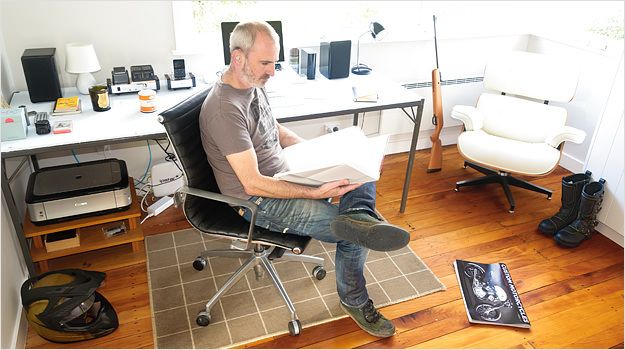 Chris Hunter (pictured above) lives in rural New Zealand, where the traffic is light and the rain heavy. Before that, he lived in Sydney, Australia. He’s English, and still misses Walnut Whips and tinned mushy peas. Wesley Reyneke lives in Cape Town, South Africa, where the roads are wonderful and it never rains. Matt Neundorf lives in Toronto, Canada, where temperatures are usually below 0 °C (32 °F) during the winter months. It stands for ‘Exchangeable Image File format’. This is the data captured by a digital camera when a photo is taken, and often stored within an image file. It’s a nod to our focus on good photography as well as good bike builds. Can I find Bike EXIF in print anywhere? Yes. 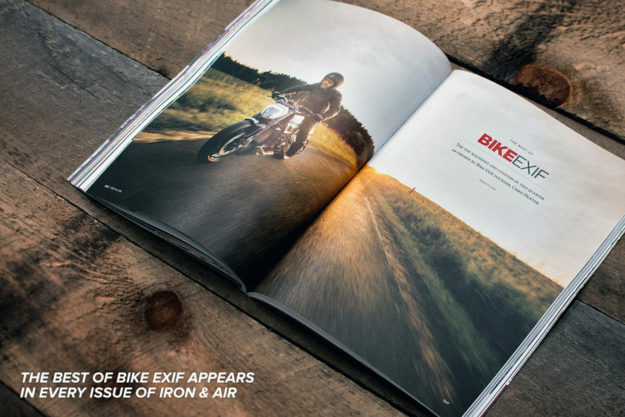 In 2013 Bike EXIF co-produced the first book on new wave custom motorcycles, The Ride. Its unprecedented sales success led to a follow-up, The Ride: 2nd Gear. In 2018, Bike EXIF co-published the first English language edition of the popular European custom magazine, CRAFTRAD. (You can buy it here.) A second issue will follow in 2019. In the past Chris has written a monthly column for the UK’s best selling motorcycle magazine, Bike, plus occasional pieces for the Japanese magazine Moto Navi and the American magazine Iron & Air. Wesley and Matt both write regularly for leading motorcycle magazines in South Africa and North America respectively. What’s your mailing address? I’d like to send some new apparel to you for review. You can reach us via PO Box 668, Warkworth 0941, New Zealand.